Plácido Domingo, the Spanish tenor best known globally for his performances as one of the “Three Tenors” with Jose Carreras and the late Luciano Pavarotti, has spoken of his emotion at fulfilling a promise made to the late John Paul II by releasing a CD of twelve new songs set to the late pontiff's poems. 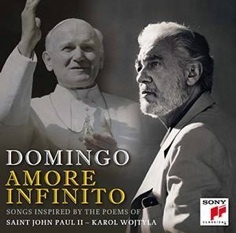 Launching the CD “Amore Infinito” (“Infinite Love”) at the Vatican, Domingo said he had suggested the project to John Paul in 2004, a year before the Pope's death, and the Pope had accepted “with joy”. The tenor said the songs, which he described as in “crossover" style between classical and popular genres, were of "immense significance to me, and not just because I am a Catholic”. He said they would appeal not only to Christians but also to “all those who hold John Paul in deep respect”. The late Pope had been “a man of rare greatness who chose to dedicate his life to the service of humanity and of God”. The singer said the Polish-born Pope was “unquestionably a saint”. He had possessed such force and energy that if he had not suffered the consequences of the attempt on his life in 1981, “he would still be Pope today”. Domingo said he had chosen poems in which the Pope had expressed insight into human emotions which would “appeal to all of us”, such as a poem about laying flowers on his mother's grave. He had invited a number of composers to submit compositions, and had chosen songs by Jorge Calandrelli, Stefano Tomaselli, and his son Placido Domingo Jr., among others. On the CD Domingo sings duets with Plácido Domingo Jr., Katherine Jenkins, Josh Groban, Andrea Bocelli and Vanessa Williams, with the London Symphony Orchestra under Nick Ingman. Three of the poems are in English: “A Mother's Wonderment”, “Gratitude”, and “Love”, the latter sung with the Los Angeles Children’s Chorus. Michael Lang, president of Deutsche Grammophon, which produced the CD, said it was destined to become “a classic”.